Bio: Always looking to do new things that I have never done before! I moved to Las Vegas from the Boston, Massachusetts area. 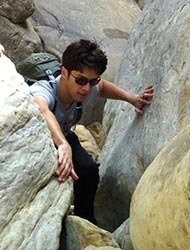 I have always enjoyed hiking, camping, climbing and all sorts of adventure. I bring an aboriginal Australian instrument called a "didgeridoo" on hikes which doubles as a hiking stick. I leave the didgeridoo behind on hikes that have scrambling or require both hands. 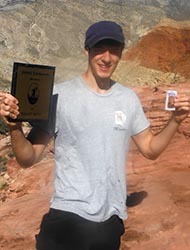 Why did you join the 52 Peak Club: My wife was seven months pregnant with our wonderful son named Craig when I joined this club. I knew that I wanted to be a strong role model for my son and so I decided to join this goal oriented group. My plan was to start with the "ace" cards, then "kings", then "queens"...all the way down to finishing with a "two card." Well...I have finally completed them all!! Message to my son: "Whatever you choose to do in your life...do your damnedest to achieve the goals you set for yourself. Be patient, the greatest rewards come with time and hard work. . Toughest Peak: Ice box peak. Certainly a fun hike, but there were a few "hairy" parts that I found a little risky. Definitely use webbing and take your time. I rank this the most "technical" of all 52 for me. Favorite Hike: Magic may have been my overall "favorite" hike. We took the hike at a good pace and Branch was leading the group. The weather was beautiful and this hike has a little of everything to offer. There is a rope to pull yourself to the top at the very end. This hike felt like a playground. My ultimate criteria for what makes a superb hike would probably come down to exactly that..."if it feels like it's a playground with lots of fun obstacles...I'm going to love it! How did you feel once you became a 53er: Incredibly excited!!! Because of the way I collected cards in a "top down" fashion it took me longer than it otherwise should or would have. Now that I am done I am looking forward to new adventures both within the 52 peak club and elsewhere. I can spend more time with my family now on the weekends and I'm sure my wife will appreciate that! Advice for new hikers: THERE IS NO TIME LIMIT!!! Take as long as you like to get all the cards...eventually...if you stick to it you will get them all! Also, do not worry about "the big cards" there are cards rated at 4 (white Rock hills for instance) that are quite hard and there are high cards that are easy (Charleston itself for example is easy, but very long). I would not recommend working "top down like I did, but I WOULD recommend planning how you sign up for cards. I made sure to get all my "Charleston" cards BEFORE winter time and got all my Lake Mead cards in one day (4 peaks in a day, exhausting!). Planning in this fashion made it a lot easier for me to pick and choose which hikes I wanted to go on...the down side of course is that I had to wait several weeks some times to do hikes in a particular order. Whichever way you decide to get your cards and become a 53er, just remember, there is only one rule...STAY SAFE and HAVE FUN...in that order!